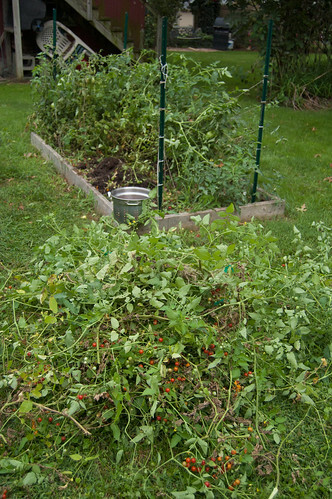 This year, I’d be lying if I didn’t fully disclose that I did an absolutely terrible job at taking care of the garden. I barely watered and crossed my fingers for rain. Tons of seeds just never grew, most of them heirloom varieties that should have been completely fine with being last year’s packet. I felt bad, I did a horrible job at tending. I was close to wanting to just rip all of the plants out (and did rip out one – she was too crazy and invasive!) and start over next year. But there were still so many hopeful green tomatoes growing and I still have high hopes of canning, so I figured the poor little things deserved a chance! I chopped and we staked and we tied them up high and we’ll see how it goes. 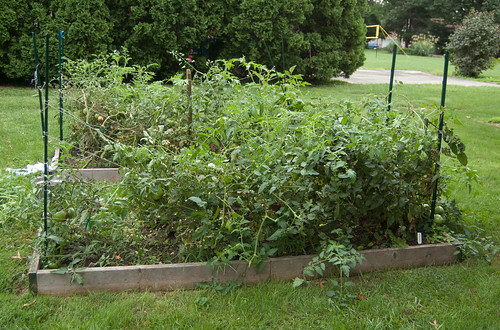 The rest of the garden: well, it’s sort of a lost cause. We still have peppers and a few eggplants and herbs. A few last stray cucumbers. And we will have massive quantities of ground cherries (local friends, just say the word and I’ll bring you some!) A few random flowers and some pumpkin and watermelon plants that I put in on a whim in July because the raised beds looked so sad sitting there empty after all of the failed attempts to get seeds to grow and plants that had already been pulled out because they were done. I knew that at the very least watermelon and pumpkins would grow some quick vines and fill up the boxes and make them look less sad and keep the soil alive, even if we never even get real fruit because of the cold. Next year: Fewer veggies. Is that awful to say? We live in the land of produce aplenty, there is so much to be had locally! We’ll have tomatoes. Peppers. Potatoes carrots onions garlic. Greens in the spring, but not too many to keep up with eating. And flowers. I think that’s going to be my goal next year – LOTS of flowers. I’m not entirely discouraged – there’s still a fall crop to be had! I want to have a cold frame over the winter for some greens (my mini-goal for the winter is to not buy lettuce at the grocery store) and a bunch of our herbs did amazingly well through the winter last year, so I’m going to put them in pots on the window sill this year. 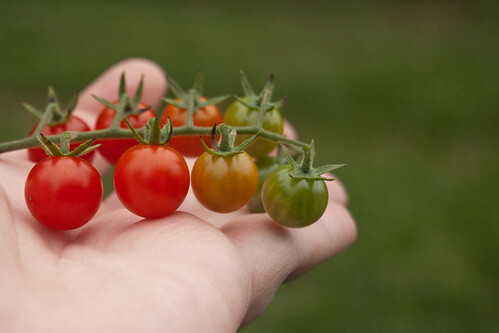 Still to plant and harvest in the fall: Beets, carrots, potatoes, spinach, leaf lettuce. To plant in the fall and (hopefully) harvest in the spring: onions and garlic. Do you garden? Did it do well this year? 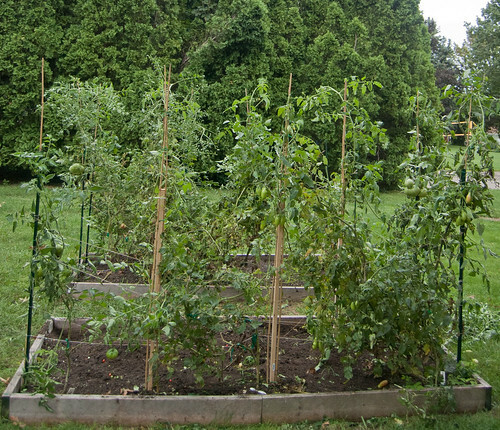 Do you plant in the fall and have any tips? I’d love to hear them! I garden. I also put my tomatoes too close together and they are a tangled mess! My beans never took but my single squash plant is monstrous. I’ve started broccoli seedlings for for fall and will also grow carrots and spinach. I want lots of flowers next year too! 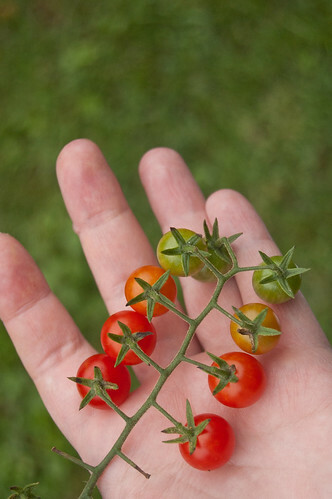 The Florida Weave does work with vining tomatoes (all of mine are indeterminates), but it looks like you need to use a stronger twine (like nylon) to weave them, and if they start to sag, you should re-tighten the lines throughout the season. Possibly there were also too many plants for the two stakes holding them all up; I usually space my plants about 2-3 feet apart. I’ve grown them as close as 1-2 feet apart, but in those cases, you should either prune the branches as they grow, or stick another stake in between them. Good luck next season if you try it again!